With the Mediterranean Sea on their northern border, the Red Sea on their eastern border, and the Nile River running through its middle, Egypt quickly became a major center of commerce in the ancient world. Although they were fairly adept sailors and very interested in what was going the world around them, ancient Egyptians generally didn’t care to wander too far from home. Instead, they invited the world come to them. Northwest of Egypt, a group of people we know as the Minoans lived on the island of Crete. The Minoans, had become exceptionally skilled shipbuilders and navigators and dominated trade throughout the Mediterranean Sea, Red Sea, and Arabian Sea bringing a vast array of goods and information from exotic lands to the Egyptians. They lived to explore and Archaeologists and anthropologists are finding that Minoans weren’t fainthearted sailors either. Archaeological finds, cultural similarities, and even genetic markers suggest that the Minoans made their way through the Straits of Gibralter to the Atlantic Ocean where they traveled as far north as the Orkney Islands in Scotland where they traded for tin. The mysterious Stonehenge monument may have been built by these ancient Mariners, not only as a place of worship but as a navigational tool. From Scotland, they may even have made their way west across the Atlantic Ocean to the North America and down the Great Lakes where they traded for copper. 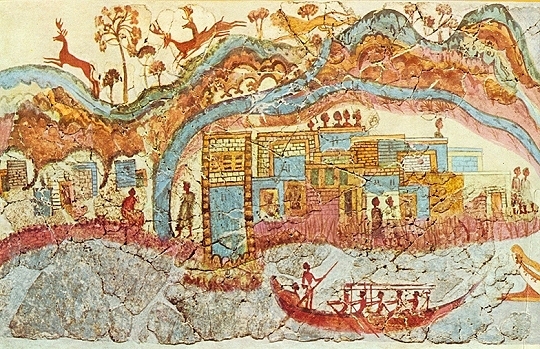 The Minoans exposure to so many different cultures throughout the ancient world not only made them very wealthy, but also helped them to create a very unique culture. It appears that they had an egalitarian society with both male and female rulers. They were also very athletic, with one of their most popular sport, performed by both men and women, was bull-leaping. Exactly how the sport was performed is unclear, but as far as we can understand, it was a ritual sport in which athletes literally vaulted over bulls as part of a ceremonial rite. 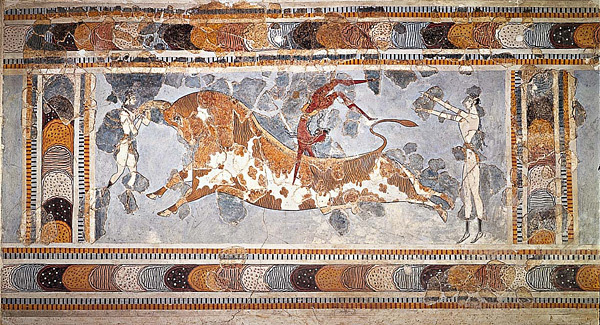 While bull worship was common throughout the Mediterreanan, the Minoans unique twist on it probably stemmed from the legend of King Minos. Long, long ago, the legendary King Minos reined as the first king on the island of Crete and all the other islands on the Aegean Sea. He was a mighty king and a great warrior and it was rumored that he was the son of the god Zeus and his human wife Europa. Although he was a great man, he was a harsh ruler and greatly feared and respected by all the neighboring kingdoms. One day, a magnificent white bull appeared in his kingdom and although the god Poseidon demanded that the bull be sacrificed to him, Minos thought it was such a magnificent creature that he decided to keep it for himself. Angered by the king’s disobedience, Poseidon cursed him with a child that was half man and half bull. As boy grew up, he became a vicious man-eating monster that they called the Minotaur. Unable to control him, King Minos had Daedalus, an Athenian craftsman, build a labyrinth that was so skillfully designed that the Minotaur could not find its way out. Daedalus revealed the secret of the labyrinth only to Ariadne, the daughter of Minos. King Minos had a strong and athletic son named Androgeus that he sent to represent Crete in the Athenian games. When he succeeded in winning most of the events, the King of Athens murdered him out of jealousy. When King Minos heard about the death of his son, he was so enraged he deployed his mighty Cretan fleet and took Athens. Instead of destroying the city, however, King Minos decreed that every nine years Athens would be obligated to send seven young men and seven virgin women to throw into the labyrinth as a sacrifice to the Minotaur.. Theseus the Athenian King’s son, volunteered to be one of the sacrificial men, intending to kill the Minotaur and end the suffering of Athens. He told his father that if he succeeded in his mission they would raise the white sails instead of the black sails on his ship when they returned. Theseus arrived at the palace of King Minos where he met Ariadne, who immediately fell in love with the brave prince. Ariadne gave him the secret of the Labyrinth, a magical spool of thread, that he could unwind as he made his way through and follow back again. Theseus killed the Minataur after a ferocious battle and escaped the Labyrinth by following the magic thread. In his excitement over freeing Athens from the fate of the Minotaur, Theseus forgot to change the sails on his ship from black to white. When the king saw the black sails, he flung himself into the sea, thinking that his son had died. This stretch of water was named after him and is still know as the Aegean Sea today. According to legend, Minos met his death in Sicily and became one of the judges of the dead in the underworld. Although it is just a mythical legend, the story of King Minos probably has some historical basis and reflects the age when the Minoan culture was supreme. The uniqueness of the Minoan culture showed in the way that they dressed. While men wore simple brightly colored and printed loincloths or kilts, women developed styles that were far ahead of their time. 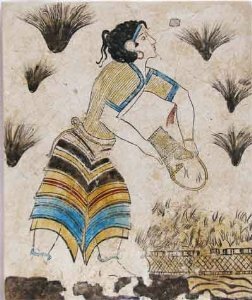 Instead of simple shawls or tunics, Minoan women wore robes with short sleeves or a strapless bodice with brightly colored and printed flounced skirts. The waistlines were fitted with a type of corset that helped to define their waistlines. The style foreshadows dresses that won’t be seen again until 1500s AD! It is quite possible that they got most of their beautiful textiles trading with the Indus Valley Civilization. Want to make a simple wrap skirt similar to the one worn by the woman in the picture below? While it is based on this ancient design, it has a timeless appeal that will fit in a modern wardrobe. Keep watching this post ! As ever, I am thoroughly enjoying the history of fashion. I never thought about corsets during that time, but then, beside the mythology mentioned, I really don’t know much about about the Minoan people. Thanks, again, for sharing this. I look forward to each month’s installment. Looking forward to seeing the skirt pattern. Very interesting! I enjoy your historical clothing articles. I don’t know much about this time period. Looking forward to seeing the skirt pattern. Wow! I never knew much about the Minoans before. I enjoyed reading the myth in its entirety and seeing how it takes its place in real history. I love the history lessons. I remember reading Greek mythology stories with my mother. No wonder we do so well on crossword puzzles and Jeopardy. Thanks for the the reminders! Melangell and I made your wrap dress last month — I made mine into a modern beach cover-up and chair cover. What’s old is new! I can’t wait for another new skirt pattern. I really enjoy the history lessons! Were you or are you also a teacher? I think high school age girls would really appreciate all your research on the history of fashion. History class was a real struggle for me because I was not interested. But I loved to sew. I think if I had learned history from a fashion and textile approach, I would have enjoyed it very much. Thank you for all you do. I look forward to your newsletter every month with tons of informative information! I am looking forward to see the pattern you come up with! So glad you covered Minoan civilization! I thinkI only heard of it related to mythology and fashion history. Love the plunging necklines and striped skirts you can sometimes see on little statues of deities with snakes!